Peyote sellers in Texas must register with the Drug Enforcement Administration in order to legally sell the “buttons” to members of the Native American Church, but the cactus species is threatened by overharvesting. Payote seller Salvador Johnson holds two peyote buttons. He has about 80,000 more on his property. In ecological terms, South Texas is known as brush country – it’s home to lots of thorny shrubs, trees and palms. Its humid climate makes it similar to parts of Northern Mexico, and it’s only in these two places where you can find one member of the cacti family which has been controversial, to say the least: peyote – genus Lophophora – is a small cactus native to the Rio Grande Valley. It contains a psychoactive substance known as mescaline, and it’s been used as a religious sacrament in ceremonies by native cultures for centuries. But selling it is barred in every state except for the one where it grows: Texas. Peyote sellers in Texas are required to first register with the U.S. Drug Enforcement Administration, and then with the Texas Department of Public Safety. They must report how much peyote they harvest from the wild, and renew their license every year. Currently, there are only four licensed peyote distributors in Texas, and one of them is Salvador Johnson. “I’ll be 72 in, probably in about three weeks. 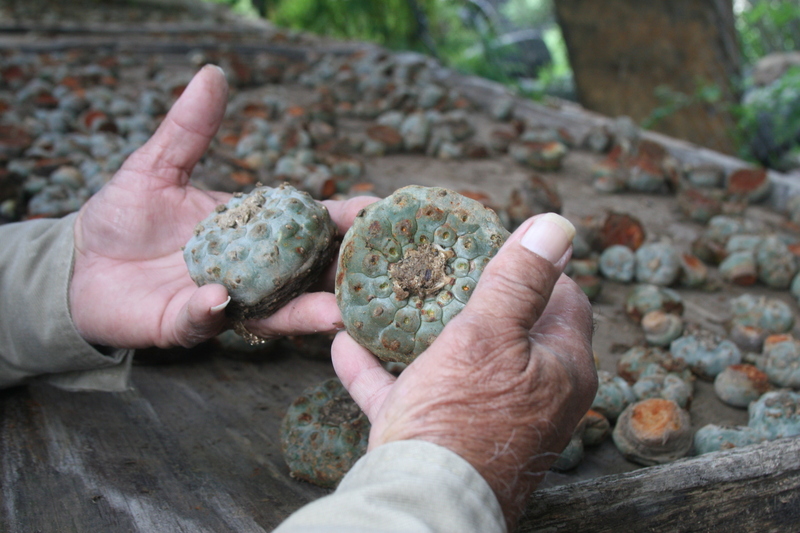 But I still harvest peyote, so still going strong, still feel young,” Johnson says. Johnson lives in Mirando City; it’s a town of less than 200 people and is about 35 miles east of Laredo. He’s lived there pretty much all his life. After graduating from high school in 1966, Johnson joined the Air Force and was deployed to Vietnam. When he came back home, he followed in his father’s footsteps. Salvador Johnson, licensed peyote distributor, at his home in Mirando City. “My father was still living and he had moved back to Mirando. He sold peyote for about 18 years. I came out back here and I applied for my license, and I started selling peyote. I’ve been doing it ever since,” Johnson says. But distributors like Salvador Johnson are only allowed to sell peyote to registered members of one religious organization called the Native American Church. To buy it, church members must prove their ancestry. “The most important document for a person to have is what we call the Certificate of Indian Blood, because that will show you who you are, who your parents are and your blood quarter; you have to be at least one-fourth [American] Indian to purchase peyote in the state of Texas, or possess peyote in the state of Texas,” Johnson says. Folks who meet these requirements drive to the Valley from every corner of the United States to buy peyote, or as church members call it, “medicine.” James Flaming Eagle Mooney is one of them. “To me, it’s a symbolic representation of God. It’s basically a truth ceremony; it shows you who you are, your godliness,” Mooney says. Mooney has known Johnson for decades – he is the former leader of the Oklevueha branch of the Native American Church. “I believe that this is the only way that a certain group of humans can get close to God, and there’s no other way. This religion could never keep on without this peyote,” Mooney says. Peyote is a small, round cactus. It has no thorns, but has unique properties that make it an especially resilient species. If you cut what’s called the “button,” which is used in ceremonies, the root has the ability to slowly regrow a new button. Still, wild peyote is on the decline. According to a report by the International Union for Conservation of Nature, there’s been at least a 30% decline over the last 20 years. Terry has been studying peyote for three decades. He says overharvesting is happening because Texas does not allow for peyote cultivation. “What is the justification behind this? Why can’t it be cultivated? That’s a very good question: If you happen to be talking to any Texas legislators in the near future, ask them that question,” Terry says. But Terry says this attitude towards peyote is nothing new. “Since the Spaniards set foot on these shores, there has been persecution of people who used peyote, and that continues to the Drug Enforcement Administration of today,” Terry says. Native American Church members like Mooney say these laws have been used as a way to persecute their people. “People need to understand that law was not just to deal with peyote; it had to deal with peyote in the sense that it was a sacrament that the indigenous peoples of North and South America had used continuously, since before recorded history,” Mooney says. The DEA lists peyote as a Schedule I controlled drug, which puts it in the same category as heroin or LSD. But distributors, users and scientists like Terry say it causes no real harm to the human body. “People using peyote in a ceremonial sense, and using it, let’s say, once a month or so, which is about how the ceremonies are spaced out, in reality – if it’s used properly, the way that it’s always been used – ceremonially – peyote is absolutely safe. And yet, we have governments putting it into things like Schedule I, which for there is no evidence whatsoever of adverse effects,” Terry says. Johnson, the peyote distributor, traces his own roots to the Mexican state of San Luis Potosí where peyote grows and is used. To him, selling it something of a family tradition; he took over the business from his father, and he hopes that will continue after him. “Either one of my daughters, my son, my grandsons: one of them, more than likely, will pick up the business that I have. But it’s something that has to come from you and your heart,” Johnson says.